Hi there I am back and up to posting again. For the past few months I have been fighting a flare up and an infection which really knocked me down for the count. Luckily, I am on the mend and excited to get back to life. 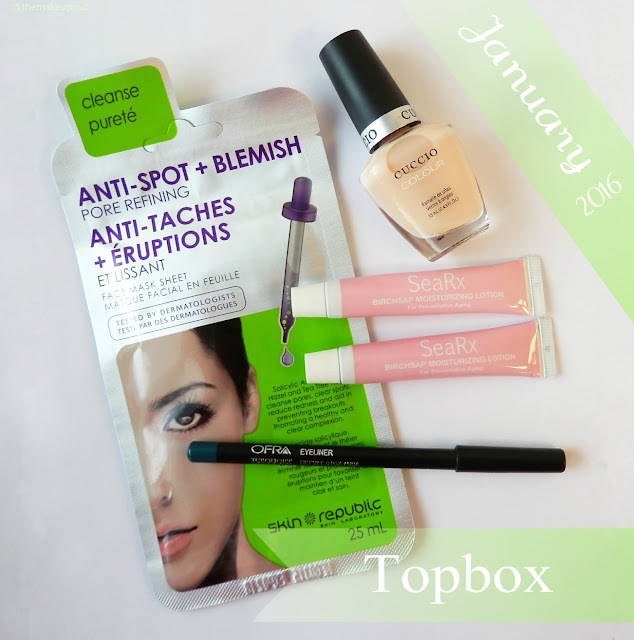 Today on Themakeupnut is the first regular Topbox for 2016. The majority is skin care with polish and a beautiful kohl liner. I had initially seen my friend's Topbox. It included Make Up For Ever, Teeez Trends and ModelCo. After viewing that box, I couldn't wait to get mine. Then I got it a few days later and to my disappointment it was not the same. So sad. This is a Korean face mask that will ‘cleanse’ the skin. It's Anti Spot + Blemish Pore Refining. Unfortunately, this one may be too drying for my skin right now. The Salicylic Acid, Witch Hazel and Tea Tree Oil may be too strong for my skin right now. I am not really acne prone but I could use a good pore cleansing. Actually, I really need something super moisturizing right now. I am not really into French manicure colours. 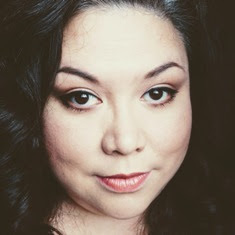 Plus I am kind of tired of trying out Cuccio all the time. New brands please. Okay first impression - based on the label, this lotion is a little scary. Not to be used by children under the age of 18. Not to be used by women who are pregnant or are nursing. What? I am a little freaked out. Do not get into your eyes – rinse thoroughly. GULP! It does smell nice though. This pencil liner is my favorite thing about this month's box. It is a lovely turquoise colour and it does have staying power. My arm swatch lasted all day with no smudging. I need to use this right away! Yeah I didn’t get a December Topbox. I was supposed to get the Benefit box according to my shipping email but it got lost in the mail. All I got for December was a refund. It wasn't Topbox's fault but damn I was really looking forward to that Benefit box. Get your own Topbox and sign up for $12 a month at Topbox.ca. It does ship within Canada only though. What a negative post for my first post of the new year! Sorry about that. Hopefully February's box will be grand. I already opted for the regular box so I am crossing my fingers!